Nelson gets a column set in a square marking his most famous victory. Wellington gets an arch in the middle of a large roundabout. I’ve seen the Wellington Arch countless times from the top deck of a 73 or 38 bus but never visited it. 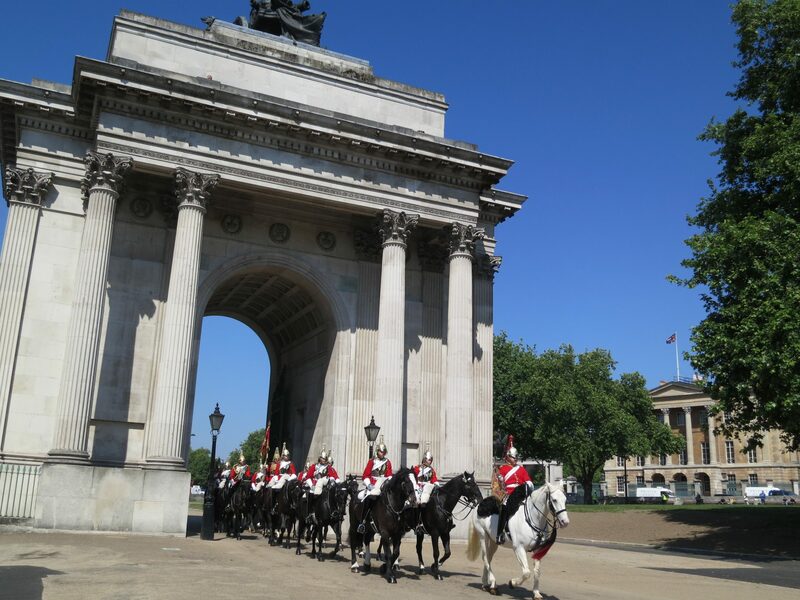 The Junior CW’s, who know more about the Napoleonic Wars than I ever will, were keen to visit so we alighted from the 38 and arrived just in time to see the cavalry riding under the arch on their way to the Changing of the Guard at Buckingham Palace. Wellington’s boots can be seen in a special exhibition to mark the bicentenary of Waterloo. Centre piece of the whole thing is a splendid electronic diorama showing Napoleon’s final defeat. Canons roar and cries of battle can be heard as a calming voice explains how the day’s events unfurled. 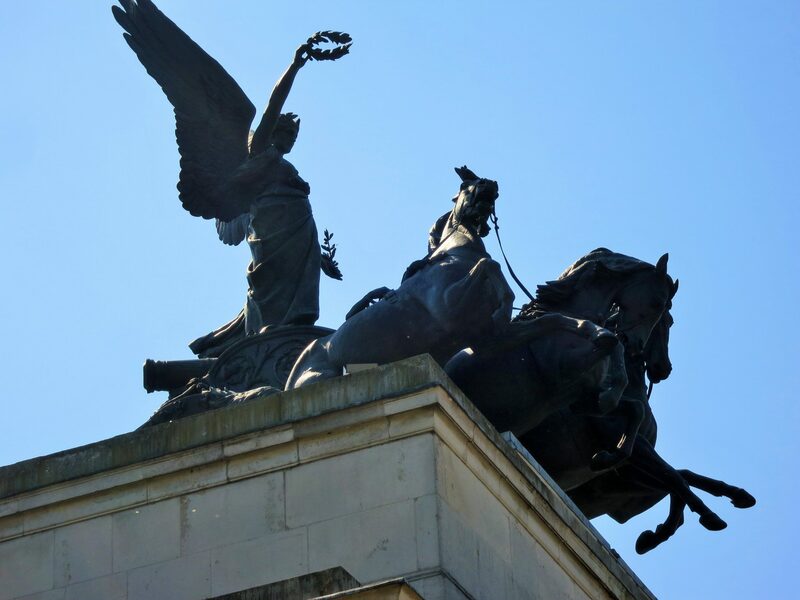 Once you have relived the battle you can climb onto viewing platforms at the top of the arch for views down Piccadilly and over the garden wall of Buckingham Palace. Equally interesting is the story of the arch itself. It was originally built as a back gate to Buckingham Palace and then morphed into a monument to Wellington topped with a gargantuan statue of the great man, so large that it became a figure of fun. In 1883 the statue relocated to Aldershot and the arch was moved to its current site, becoming a park lodge on one side and a police station on the other. Today the Angel of Peace presides and is the largest bronze statue in Europe. In the 1960’s an underpass was built under the roundabout and one side of arch became a vent for the exhaust fumes.